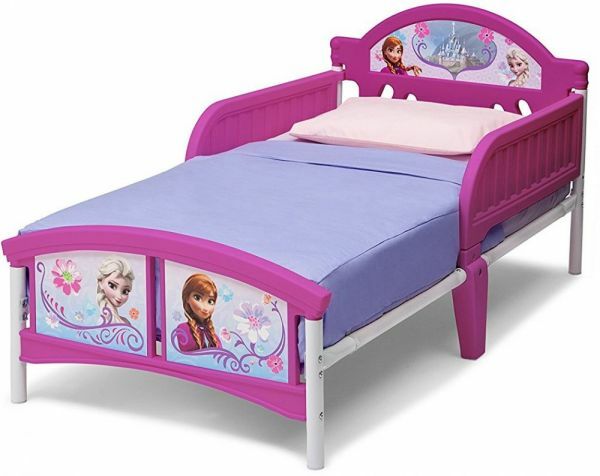 Bedtime becomes magic for your little girl with this made of Steel and Plastic Junior Bed with colourful graphics of the Queen from Frozen by Delta Children. Decorated with wonderful colourful pictures of favourite characters, this bed has a solid Steel and Plastic construction and is close to the ground to comfort your child. It meets or exceeds all safety standards set by the CPSC. Delivering to large retailers and trusted by millions of families worldwide, Delta Children has formed a number of good partnerships with some of the most prestigious brands. They have a collection of nursery furniture, kids’ furniture, and baby gear. They are an owner of Simmons Kids as well as licensor of Disney, Nickelodeon, Marvel, DreamWorks, Sanrio, Lucasfilm, Sesame Street, Simmons Kids, Serta and Jeep products. Their team works closely with leading safety organizations, like JPMA and ASTM to create industry standards that ensure your little one’s wellbeing.